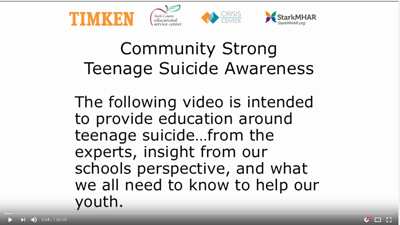 With almost 1,000 associates in the Canton area, The Timken Company recently engaged their employees to raise suicide awareness through education, open conversations and transparency. They invited members of the local educational and mental health communities to their world headquarters where they hosted several informal meetings designed to reduce stigma and better understand and recognize the signs and symptoms of suicide as well as offer support for prevention. Leadership at The Timken Company is making the content of these meetings available to other employers in the area to use with their teams to better champion the cause. Please take a few minutes to review the videotaped presentations from these sessions and consider sharing with your own employees. The presentations feature valuable information from education and mental health experts.